I first fell pregnant in 2012, unfortunately, at our 12 week scan we were told that the baby had stopped growing at about 5-6 weeks. It’s called a missed miscarriage. We were completely shocked and devastated. Thankfully, I found out I was pregnant again in April 2013. My husband, Tim, and I couldn’t stand the wait until the 12 week scan so paid to have a 7 week one. We were hugely relieved when all was well. However, after a week or so the doubt and worry started to creep in again. At the 12 week scan everything was fine, healthy and on track. Again we felt huge relief, but it was soon starting to be overshadowed by doubt and worry. The happiness never seemed to last that long. I certainly didn’t ever feel a bond with my baby like some women say they do. I suppose I never let myself become attached to the pregnancy for fear that it wouldn’t go to term. Thankfully Annabelle did go to term, both the 20 week scan and the private one we had at 32 weeks showed a perfectly healthy growing baby. On New Years Day 2014 I went into labour. My waters started to go as we were going to bed. I called the hospital and then we took a trip to the hospital for the midwives to check it was my waters, it was. Then we came home to let things start. I wanted a water birth, but there was only one pool, so it was fingers crossed. The contractions started as we were leaving. I had a TENS machine, I have no idea if it helped or not! I was in pain, mainly in my back. I was tired before it even started after a busy new year. All I wanted to do was sleep. Laying down hurt, sitting up hurt. I was not happy. We went back to the hospital when my Tim had decided the contractions were close enough. We were both anxious about getting there on time and not leaving it too late. I felt that I needed to be in hospital, I had no idea how to give birth, midwives had to tell me what to do!! The midwives examined me and I was 7cm, which was good to hear. I had an injection of morphine so that I could try and rest. I managed to get comfortable on my side and get a bit of sleep between contractions. There was no pool available, so it was dry land for me. Labour progressed well and I was starting to push. The midwives then wanted to put a heart monitor on her but there wasn’t one available so we had to move rooms, and after that there was just no progress, she’d managed to get herself stuck. Doctors were called in after I’d been pushing for over an hour to no avail. I was on the bed, legs in stirrups and given an episiotomy. Then they tried with the ventouse machine. That failed a couple of times before they moved onto the forceps. Annabelle was finally born at midday, 12 hours after my waters breaking, and giving me a 3rd degree tear in the process. I was expecting the rush of love, the overwhelming emotion at having my little baby – it never came. I remember Tim asking me if I wanted to hold her after the Dr’s had checked her and I really wasn’t bothered. I just wanted to curl up and go to sleep. Things didn’t stop there. I lost a lot of blood – not quite enough to warrant a transfusion though. But I did need to be stitched up, in theatre. So I was given an epidural (after going through birth on gas and air as the morphine had worn off!) and taken down to theatre after a quick cuddle and breastfeed (which she amazingly took to so easily) with Annabelle. I was reunited with Tim and Annabelle in recovery and fed her again. I had to stay in overnight but was back home the following day. I was battered and bruised, in pain. Emotionally broken. Yet I had this tiny human to take care of. Breastfeeding was going fantastically, looking back I’m utterly shocked that it did with so little skin to skin and time together straight after the birth. She was obviously a pro. My mental health wasn’t right from the off but I just ignored it. I managed to, somehow, make it a whole year before admitting I needed help. I was diagnosed with Post Natal Depression and finally got help. I wish I’d done it much earlier. Then we got pregnant with Imogen in July 2016. It was a totally different feeling. I was more confident, I knew so much more, and wanted to do it differently. I wanted another natural birth, but with the previous trauma of the tear, I wasn’t sure if it was wise. Thankfully the consultant gave me the go ahead! Relieved is an understatement, I was so anxious waiting for that appointment. I found the local hypnobirthing classes and joined those. The one biggest thing I feel I took from that was the fact that I am in charge of my body. I can question midwives and Dr’s. They do not have the final say. More importantly, I can say NO. It gave me the feeling of power, that I could do this my way. I was far more relaxed heading up to the birth. I wanted a water birth again, I had opted to go to hospital due to the uncertainty of a possible c-section at the start, but in hindsight I should’ve stayed at home. This time I wasn’t going to hospital for the midwives to tell me how to have a baby. This time I knew my body would do it by itself and I would just listen to it. I was so much more relaxed, no fear or worry. I was having no interference, I was doing this my way. It was empowering. My contractions started first this time before my waters broke. It was a similar time though, just getting into bed. They were quite strong from the off. We rang the hospital to notify them that I’d be along at some point. I was convinced we’d be ages. I went downstairs put my music on and started bouncing on my ball. Less than an hour later Tim decided we were going to hospital – I was still convinced it would be ages. But he wasn’t having any of it and called his mum to come and watch Annabelle. He abandoned the call to come and catch Imogen before she head-butted the glove box. She was born at 1.25am. 1hr and 35mins after the first contraction. I put her under my nightie and wrapped us in blankets. The paramedic arrived and got into a fluster about cutting the cord – I was having none of that, we were doing delayed cord clamping. She saw we were both fine and relaxed a little, so just got us to follow her up to the hospital. Imogen had started to breastfeed en route. The midwives got me out of the car, and took me in to get the placenta delivered. We were both fine, I had a 2nd degree tear, but I barely knew about it. It was nothing compared to last time! We all made it home just as Annabelle was waking up for the day. I still can’t believe it happened. I still have such fond memories of it. It makes me smile when I think of it. I had no fear. I was just giving birth, by myself. Doing what our bodies are meant to do. An unplanned free birth I suppose. Still didn’t manage a water birth though did I! I’m Deborah, I’m a mum of two girls (2 and 5) We live in Laindon, Essex. 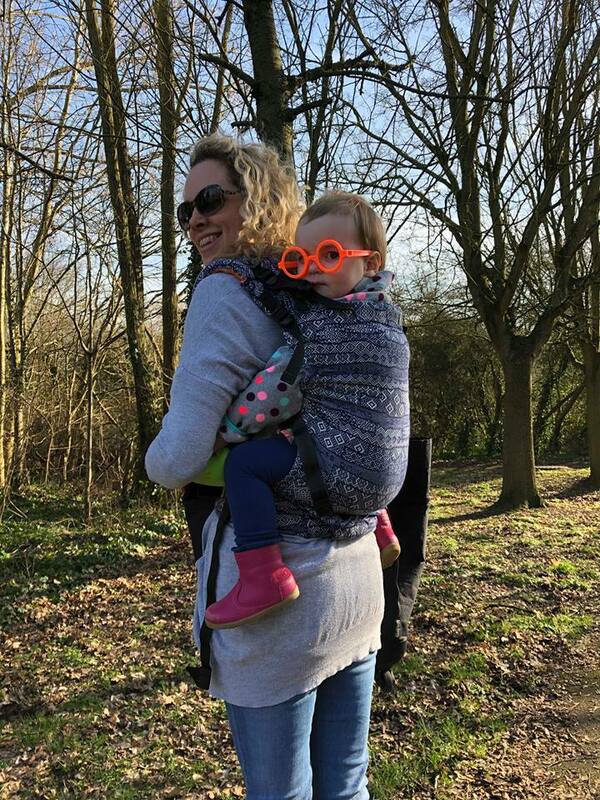 I’m a hairdresser by trade and I found the love of Babywearing when my eldest was about 9 months. Since then I’ve done my Babywearing peer support course, started the South Essex Slings library and consultancy, completed my Slingababy consultancy course and an ABM breastfeeding peer support course. I love to help families find ways to carry comfortably and safely. I love the joy on their faces when they realise how lovely it can be.